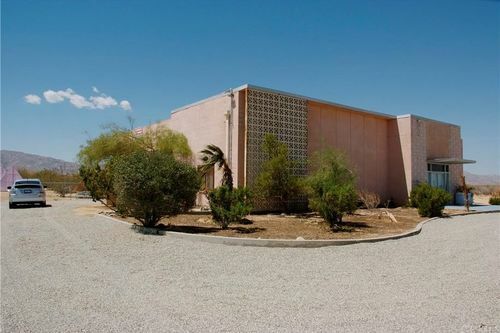 Designed by the famous Palm Springs architect Don Wexler (Palm Springs Airport, Dinah Shore House), this 5,000-square-foot block building was originally a US Post Office and sits on +/-3 acres of commercially zoned land. The structure has been reconfigured as a very stylish residence that includes high ceilings, a beautiful master suite, a large kitchen, large lounging areas and great storage space. The original vault and men's and women's restrooms are intact. There are also 7 private soaking tubs inside. Just outside the building are several pyramid-style cabanas. The pyramids and grounds along with the tubs and the large kitchen were set up to be used as a raw food and meditation retreat. The remaining +/- 129 acres are zoned RL and include 2 agricultural water wells which make this property a fantastic opportunity for commercial agriculture. Or, it could be a mixed use spa retreat and ag. facility. Weather you are looking for a fabulous home on 132 acres, an agricultural facility, or a spa retreat, this property is a must see. There is also a public airport nearby.